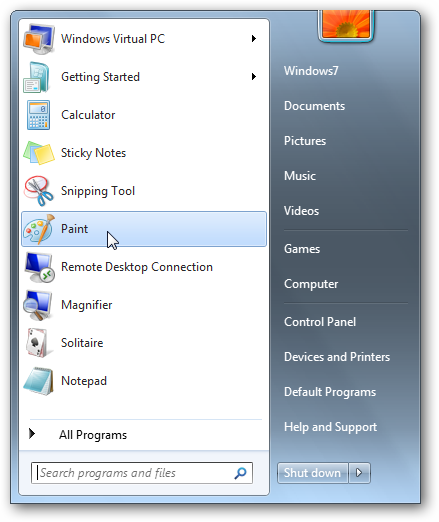 If you’re moving from XP to Windows 7, you might need some help with the changes to the Start Menu. Here we have put together a list of some useful tips that will help you take control and master the Start Menu in Windows 7 and Vista. There are links to several things on the Start Menu by default, but the Videos folder is not one of them. 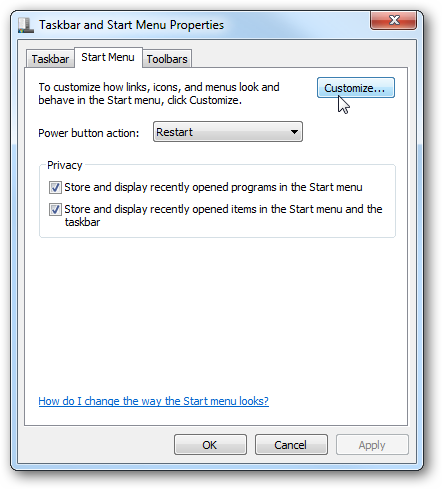 To add it right-click on the Start button and select Properties, and under the Start Menu tab click on Customize. Now scroll down to Videos and select Display as a link and click Ok. Videos now appears on your Start Menu. A few weeks ago we showed you how to search websites from your desktop using search connectors in Windows 7. Another neat trick is adding Internet search to the Start menu (this uses Local Group Policy Editor which is only available in Professional, Enterprise, and Ultimate versions of Windows 7). Go to Start and type in gpedit.msc into the search box. 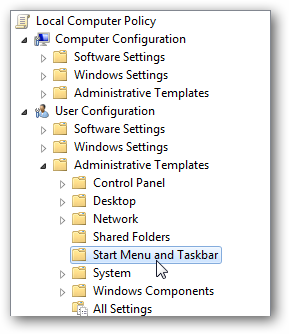 In Local Group Policy Editor go to User Configuration \ Administrative Templates \ Start Menu and Taskbar. 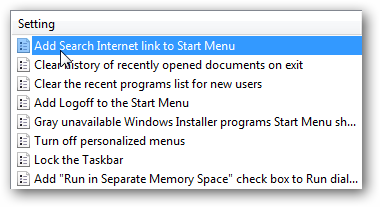 Under Setting double click on Add Search Internet link to Start Menu. 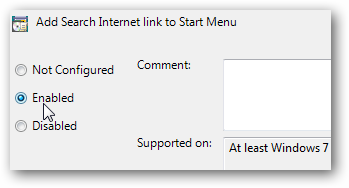 Set it to Enabled and hit Apply and OK.
Now when you go to search from something from the Start Menu you will see the Search the Internet link. The program icons in the Start Menu are large by default and if you want to display more recent programs, it makes the menu much larger on the screen. We can make the icons smaller and add more items by right-clicking on Start \ Properties and click the Customize button. Scroll down and uncheck the box next to Use large icons then click Ok. 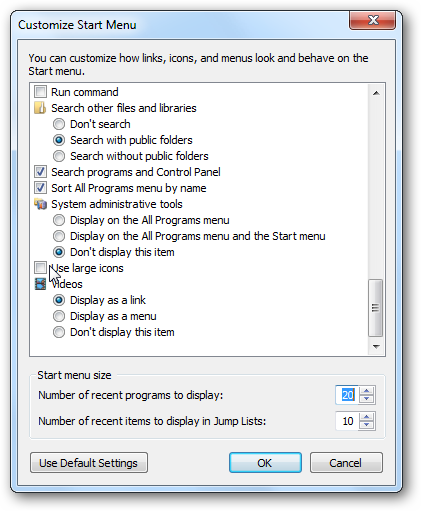 Under Start menu size increase the number of recent programs to display. The result is smaller icons with more being displayed in the menu without taking up extra screen real estate like in this example. Here’s a list of more Start Menu tweaks that we’ve already covered,but are worth revisiting to help you take control of the menu. Most of these are for Windows 7 and Vista but a few are for XP too. These should get you started for now, and we’ll undoubtedly have more in the future. How about you guys? 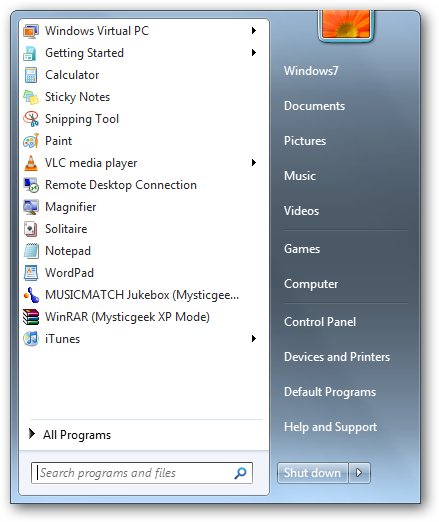 Share some of your favorite Start Menu tweaks that help you manage Windows more effectively.